Bird Box is a 2018 American post-apocalyptic thriller film, directed by Susanne Bier from a screenplay written by Eric Heisserer, and based on the 2014 novel of the same name by Josh Malerman. The film follows a woman, played by Sandra Bullock, and a pair of children, who must travel through a forest and down a river blindfolded to avoid supernatural entities that cause people who look at them to commit suicide. Bird Box had its world premiere at the AFI Fest on November 12, 2018, and began a limited release on December 14, before streaming worldwide on Netflix on December 21, 2018. Bird Box is a 2018 American post-apocalyptic thriller film, directed by Susanne Bier from a screenplay written by Eric Heisserer, and based on the 2014 novel of the same name by Josh Malerman. The film follows a woman, played by Sandra Bullock, and a pair of children, who must travel through a forest and down a river blindfolded to avoid supernatural entities that cause people who look at them to commit suicide. In a post-apocalyptic world, Malorie Hayes advises two young, unnamed children that they will be going downstream on a river in a boat. She strictly instructs them to not remove their blindfolds, or else they will die. Five years earlier, a pregnant Malorie is visited by her older sister, Jessica. A news report is being shown on television about unexplained mass suicides originating in Russia quickly spreading across Europe. Malorie has a routine pregnancy checkup with Jessica accompanying her to the hospital. When leaving the hospital, Malorie sees a woman bashing her head into a glass panel followed by others panicking as chaos quickly erupts throughout the town. Malorie and Jessica attempt to drive away from the violence, but Jessica witnesses the phenomenon affecting the masses, loses control of herself as she drives, and the car ends up overturning. An injured Malorie then witnesses Jessica walk into the path of an oncoming load truck, killing herself. Malorie attempts to flee on foot through the mass chaos on the streets. A woman, Lydia, invites Malorie over to a house for safety, even though her husband, Douglas, disagrees. However, right before she reaches Malorie, she goes into a trance, begins talking to her dead mother, and casually climbs into a burning car, which subsequently explodes. Malorie is rescued and brought into their house by Tom, a fleeing passerby. While recovering at their base, one of the survivors, Charlie, theorizes that an otherworldly entity has invaded Earth, taking the form of its victims' worst fears and driving them insane before causing them to commit suicide. At the insistence of Tom they cover all windows in the house and blindfold themselves whenever they must venture outside. Later, Greg volunteers to tie himself to a chair while monitoring the surveillance cameras to find the issue of the entity but kills himself by rocking his chair violently and slamming his head into a hearthstone after seeing it. As the supply of food decreases (and with the arrival of a new survivor, Olympia, who is also pregnant), Tom, Malorie, Charlie, and fellow survivors Douglas and Lucy decide to go to a supermarket close by to restock. Malorie finds pet birds and decides to take them along with their supplies. The group attempts to help a coworker of Charlie who is locked outside the supermarket begging for help, and whom Charlie describes as "a little crazy". As they contemplate the risks of opening the door, the birds that Malorie was saving go into a hysterical fury. The group is attacked by the infected coworker, who was not killed by the entity but is instead used to infect others. Charlie sacrifices himself to save the others, who are able to make it back safely to the house. Sometime after, Felix (a survivor) and Lucy steal the car and drive away. Soon thereafter, Olympia lets Gary, a stranger and apparent lone survivor of another group, into the house, against Douglas's objections. Douglas gets extremely upset and starts threatening the others with a shotgun, and is knocked unconscious by Cheryl (an elderly survivor). Douglas is subsequently imprisoned in the garage. Later, Olympia and Malorie go into labor, and Cheryl helps with the births. Gary starts to take out various drawings of the entity and seems to undergo a trance, indicating that he could have already been partially overtaken by the entity when he arrived. He peeks outside and is completely taken over; he then knocks out Tom and proceeds to remove all the coverings from all the windows. Olympia then jumps out of the window and Cheryl grabs a pair of scissors and stabs herself in the neck. Douglas is killed by Gary when Douglas tries to stop him. While Malorie tries to protect the newborn babies (Malorie's boy and Olympia's girl), Tom recovers consciousness in time to overpower and kill Gary. Five years later, Tom and Malorie are living together with the children, whose only names are "Boy" and "Girl". They receive a transmission from a survivor stating that they are well and safe at a community hidden in the forest. The four decide to go to the community, but are ambushed by a group of infected survivors along the way. Tom sacrifices himself to save Malorie and the children. Malorie, the children, and their pet birds (which are contained in a box to protect against the entity) make their way blindfolded down the river on a boat. They fight off an infected survivor and survive raging rapids. The entity chases and tempts the children and Malorie to remove their blindfolds but is unsuccessful, and the three eventually reach the community. Malorie learns that the community is a former school for the blind and that many members of the community are blind. Because of this, Malorie releases the pet birds from the box to the other birds up on the ceiling. Malorie finally gives the children names (Tom and Olympia). The film rights to Bird Box were optioned by Universal Pictures in 2013, prior to the book's release. Scott Stuber and Chris Morgan were set to produce the film, with It and Mama director Andy Muschietti attached as director. Screenwriter Eric Heisserer was in negotiations to pen the script. In July 2017, after Stuber became head of the feature film division of Netflix, it was announced that Netflix had acquired the rights to the book and would develop the film, with Sandra Bullock and John Malkovich starring. Susanne Bier was announced as the director. In July 2017, Sandra Bullock and John Malkovich were cast in the film as Malorie Hayes and Douglas. In October 2017, Danielle Macdonald, Trevante Rhodes, Jacki Weaver, Sarah Paulson, Rosa Salazar, Lil Rel Howery, and Amy Gumenick joined the cast. In November 2017, Machine Gun Kelly and David Dastmalchian were also added. Principal photography began in California in October 2017. Wilderness scenes were shot on the Smith River in the far northern part of the state. The house exterior is from a place in Monrovia. Cinematography partially took place in Santa Cruz, and the final scene was shot at Scripps College. The production used real-life birds during filming as much as possible, replacing them with digital birds for sequences when the birds became "agitated." The film uses footage of the Lac-Mégantic rail disaster, which caused the death of 47 people in the town of Lac-Mégantic, Canada on July 6, 2013. The stock-footage was purchased from a vendor and Netflix has said it will stay in the movie even after a request to remove it from survivors of the disaster. The same footage was also used in another Netflix production, Travelers, but has since been removed. The film had its world premiere at the AFI Fest on November 12, 2018. However, due to the Woolsey Fire that hit California and out of respect for the victims of the Thousand Oaks shooting, Netflix cancelled AFI Fest’s red carpet coverage scheduled for the premiere. The film began a limited theatrical run on December 14, 2018, before streaming on Netflix on December 21, 2018. A week later, Netflix reported that Bird Box had the biggest seven-day viewership for any of its original films to date, with over 45 million accounts, with views defined by the company as the film streaming for over 70 percent of its time. This claim has been met with skepticism from analysts, who cited a lack of independent verification of the view count. According to Netflix, the film was viewed by 80 million households in the month following its release. In Australia, Netflix originally partnered with four Twitch streamers in performing what they called a Bird Box challenge, in which they would play some popular video games while blindfolded. However, the challenge became widely mimicked on the Internet by individuals wearing blindfolds while trying to do ordinary activities, causing injuries to some. In response, Netflix released several messages over social media advising people not to undertake the challenge or hurt themselves. Nevertheless, in January 2019, a 17-year-old in a blindfold taking part in the craze drove into oncoming traffic in Utah and crashed her car, prompting the police in the state to issue the same warning as Netflix. On review aggregator Rotten Tomatoes, the film holds an approval rating of 62%, based on 139 reviews, with an average rating of 5.7/10. The website's critical consensus reads, "Bird Box never quite reaches its intriguing potential, but strong acting and an effectively chilly mood offer intermittently creepy compensation." On Metacritic, the film has a weighted average score of 51 out of 100, based on 26 critics, indicating "mixed or average reviews". Brian Tallerico for RogerEbert.com, maligned that "Most of the problems with Bird Box come back to a thin screenplay, one that too often gives its characters flat, expository dialogue and then writes itself into a corner with a climax that's just silly when it needs to be tense." Amy Nicholson, in a review for British newspaper The Guardian, gave a negative appraisal, awarding the film 2 out of 5 stars and concluding that "as the film staggers on in its quest to give us entertainment satisfaction or death, we're tempted to identity [sic] with the movie's first victim, a woman in a tracksuit banging her head against the glass, ready to get this painful sight over with." Writing for Forbes, Sarah Aswell described the movie as one "that embraces everything about the (horror genre) formula, both good and bad – this movie has moments of true, delightful, fright, but it also has some of the corniness and shallowness that many horror movies can't shake." ↑ "Bird Box". AFI Fest. Retrieved October 26, 2018. ↑ "DETROIT PROUD: Josh Malerman". CBS. Retrieved January 25, 2018. 1 2 Kit, Borys. "'Mama' Director to Helm Adaptation of 'Bird Box' (Exclusive)". Hollywood Reporter. Retrieved January 25, 2018. ↑ "Eric Heisserer In Talks To Adapt 'Bird Box' For Universal". Deadline. Retrieved January 25, 2018. 1 2 3 Kroll, Justin. "Sandra Bullock to Star in Netflix Thriller 'Bird Box'". Variety. Retrieved January 25, 2018. ↑ Kroll, Justin. "John Malkovich Joins Sandra Bullock in 'Bird Box'; Eyes Peter Berg's 'Mile 22' (EXCLUSIVE)". Variety. Retrieved January 25, 2018. ↑ Kroll, Justin. "Sandra Bullock's 'Bird Box' Rounds Out Starry Cast (EXCLUSIVE)". Variety. Retrieved January 25, 2018. ↑ N'Duka, Amanda. "James Landry Hebert, Adam Bartley Cast In 'Donnybrook'; Amy Gumenick Joins 'Bird Box'". Deadline. Retrieved January 25, 2018. ↑ Kroll, Justin. "Machine Gun Kelly Joins Sandra Bullock in Thriller 'Bird Box'". Variety. Retrieved January 25, 2018. ↑ N'Duka, Amanda. "David Dastmalchian Joins Sandra Bullock In Netflix's 'Bird Box'". Deadline. Retrieved January 25, 2018. 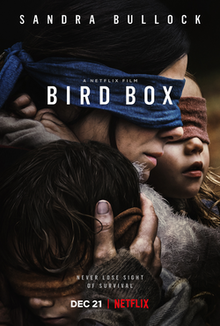 ↑ "Susanne Bier Begins Filming Netflix Movie Bird Box". Nordic Drama. October 31, 2017. Retrieved January 25, 2018. ↑ "Was 'Bird Box' filmed in Sacramento? Well, no". KXTV. Retrieved 3 January 2019. ↑ "'Bird Box' Home Becomes Unexpected Tourist Attraction". TMZ. Retrieved 3 January 2019. ↑ "Blog". Santa-Cruz. Retrieved 25 January 2019. ↑ "Books to Film: Josh Malerman's Debut 'Bird Box' Lands on Netflix". Publishing Perspectives. 25 December 2018. Retrieved 3 January 2019. ↑ "Bird Box Location: The river in California where the Netflix movie was filmed". Atlas of Wonders. Retrieved 3 January 2019. ↑ Bobrowsky, Meghan [@BobrowskyMeghan] (24 December 2018). "Last winter break, Sandra Bullock was at @scrippscollege, shooting a scene for her new movie, Bird Box. This winter break, the movie came out on @netflix!pic.twitter.com/7YR9EiR6b0" (Tweet). Retrieved 3 January 2019 – via Twitter. ↑ "You can take off the blindfold and see these Bird Box film locations". Gofamgo. Retrieved 19 January 2019. ↑ Ian Failes (26 February 2019). "Inside the BIRD BOX of Effects". VFXVoice.com. Retrieved 26 February 2019. ↑ "Angry Canadian Train Crash Survivors Claim Netflix Used Disaster Footage in "Bird Box"". Fortune. Retrieved 25 January 2019. ↑ "Netflix won't remove controversial Bird Box scene". MSN. Retrieved 25 January 2019. ↑ Hammond, Pete (October 11, 2018). "AFI Fest Adds Gala Screenings 'Green Book', 'Widows', World Premiere Of Netflix's 'Bird Box' With Sandra Bullock And 'The Kominsky Method' TV Series". Deadline Hollywood. Retrieved October 11, 2018. ↑ Malkin, Marc. "Netflix Cancels Sandra Bullock's 'Bird Box' AFI Fest Red Carpet as California Fires Continue to Rage". Variety. Retrieved November 13, 2018. ↑ Parfitt, Orlando (January 22, 2018). "15 Netflix Original movies to look out for in 2018". Screen International. Retrieved January 22, 2018. 1 2 Spangler, Todd; Spangler, Todd (28 December 2018). "'Bird Box' Viewed by 45 Million Netflix Members in First Week, Company Says". ↑ Film, Netflix (28 December 2018). "Took off my blindfold this morning to discover that 45,037,125 Netflix accounts have already watched Bird Box — best first 7 days ever for a Netflix film!pic.twitter.com/uorU3cSzHR". ↑ Alexander, Julia (30 December 2018). "Netflix says over 45 million accounts watched Bird Box — here's what that means". The Verge. Retrieved 3 January 2019. 1 2 "'Bird Box' challenge: Netflix urges people to stop due to safety concerns". USA Today. 2 January 2019. Retrieved 3 January 2019. ↑ "Bird Box drives Netflix subscribers to 140m". 2019-01-18. Retrieved 2019-01-18. ↑ Stevenson, Leo (14 November 2018). "Netflix teamed up with Twitch streamers to promote the new film Bird Box". powerup-gaming.com. Retrieved 3 January 2019. ↑ "US driver in 'Bird Box blindfold' crashes". BBC News. 11 January 2019. Retrieved 12 January 2019. ↑ "Bird Box (2018)". Rotten Tomatoes. Fandango Media. Retrieved January 14, 2019. ↑ "Bird Box reviews". Metacritic. Retrieved January 4, 2019. ↑ Tallerico, Brian. "Bird Box Movie Review & Film Summary (2018) | Roger Ebert". www.rogerebert.com. Retrieved 2019-02-01. ↑ Nicholson, Amy (2018-11-14). "Bird Box review – Sandra Bullock's Netflix thriller is a bird-brained mess". The Guardian. ISSN 0261-3077. Retrieved 2019-02-01. ↑ Aswell, Sarah. "I Wrote This 'Bird Box' Review While Blindfolded". Forbes. Retrieved 2019-02-01. ↑ Tapley, Kristopher; Tapley, Kristopher (15 January 2019). "'Avengers,' 'Lost in Space,' 'Ready Player One' Lead Visual Effects Society Nominations". Retrieved 25 January 2019.